We all think of the space inside our garden wall or fence as our empire and of course it is, but the way we demarcate our empire from the rest of the world sends out an important message. So, what’s it to be, a fence or a wall? Very often, it comes down to cost. In general, fences are cheaper to install than walls are to build. However, walls last longer and make you feel more secure; they really section off your garden. Then again, fences offer a lot more variety – you can use lots of different woods, different designs, like slatted or close-board, or even a post and chain version if you’re after a bit of old-world sophistication (you probably need the appropriate Georgian house to really get away with this, though). If you have a Victorian era house you might find a wrought iron fence a great choice, but if you have an older country cottage then you can go full-traditional and erect a white picket fence – yes, really. 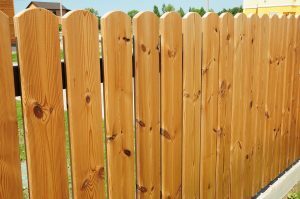 You must make sure that your fence fits in with the look and colour scheme of the outside of your house. If you have a redbrick house, try to use the same type and colour of brick, as well as the same sort of bonding; it’s actually fairly easy to find reclaimed bricks. If your house has made of stone, you should try to source the same sort of stone for your wall. Copyright for the image within this blog post is owned by ‘bildlove’, and has been licenced for use on this blog post through Big Stock Photo (stock photo ID: 182505487). For questions relating to this image please contact the copyright owner directly.